It is hard to believe, but for many years the industry standard method of connecting ducts was to use duct tape! We all know how long tape lasts. Look at some of your old documents and you will see that the tape has lost its stickiness, it is brittle and faded. The same is true with the tape on your ducts. If your duct system has never been pressure tested, call us. Our technicians carry a piece of equipment called a “duct blaster” that is used to pressure test and identify just how leaky your duct system is. 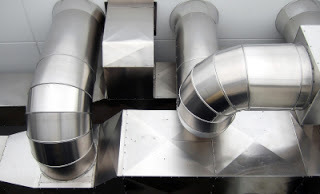 For some older duct system, we may find that it is better to consider replacing the entire duct system with new ducts that are clean, insulated, tightly sealed, and designed to deliver optimal airflow to your home. Duct leakage can create serious health hazard risks by altering critical pressure balances in homes. These imbalances can literally bring deadly carbon monoxide containing flue gasses into your home. Leaks on the return air side of your furnace duct system can also create health hazards by drawing toxic chemicals, mold, allergens, humidity, dust, crawlspace pesticides and other contaminants into your home. Upgrading your duct system is frequently the first step to a healthier and energy efficient home.